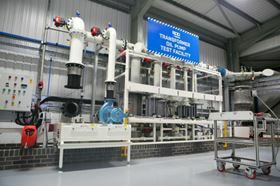 SPP's transformer oil pump test facility. The new 290 m2 unit will be semi-automated, with the very latest in lean manufacturing methods and a streamlined process that takes parts right from washing through to automation and testing in less than an hour. George Wright, business manager of the division, said he believes that SPP is raising the bar as far as manufacturing facilities are concerned. “This is a thoroughly modern, state-of-the-art facility. It will take us forward into the far future and cement our position as a leading manufacturer in this sector,” said Wright. “Testing is a critical part of the production process, and with our test methods exceeding European legislation standards, we are confident we will give customers both here and abroad a real advantage. We want people to know SPP is growing ever stronger and will be pushing even harder across our whole portfolio,” added Wright. As well as increasing manufacturing capacity, the new unit has the potential to open up additional employment opportunities. “There aren’t that many companies in our industry that are increasing their workforce at the moment and while a high level of automation is in place at the new facility, we are still seeing great take up of both our apprentice and graduate schemes. In fact one of our former apprentices has just taken up his new position in Dubai as country manager of the Oil & Gas division there. It’s something we are really good at as a company, if we recognise talent, there will be every opportunity to progress within SPP Pumps,” said SPP HR manager Sandra Oliver. SPP Pumps is a subsidiary of Kirloskar Brothers Ltd.
Energy Recovery takes out a lease for the company’s new commercial development centre in Texas.